Stainless Steel Healthcare Casework from Continental Metal Healthcare is designed for hospital and ASC applications. CMP specializes in Hospital Grade Stainless Steel Medical Cabinets. 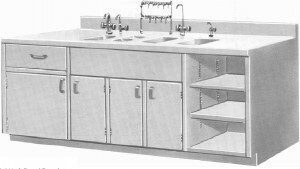 Stainless Steel Cabinets, tables, sinks, ice stations, and more can be customized in many different styles. Information is included on sample types below. For custom stainless steel casework or other questions, please contact us.